Coffee is the most complex food known to man. It has 1200 flavor components. The nearest comparison is red wine with 450 chemical compounds in the flavor make-up. In most commercial blends there are 10 to 12 different coffees, from different farms (BBC, http://goo.gl/m2LwD). Caffeine is a drug of abuse, like alcohol or cocaine, because it meets these two criteria: "reinforcing efforts" and "adverse effects which can cause harm to self or society." Reinforcing effects is science talk for "addictive": The more you have, the higher your tolerance levels and the more you need. Take it away, and you experience withdrawal symptoms. C8H10N4O2 is a chemical compound found in beans, leaves and fruits of some plants. It's a natural pesticide for them, paralyzing and killing insects that try to feed on them. On humans it acts as a stimulant on the central nervous system and has psychotropic effects. It increases heart rate, blood pressure and respiration, and it is mildly diuretic. 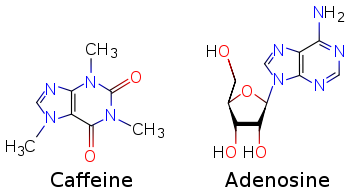 Caffeine is structurally similar to adenosine. Image source: Wikipedia, public domain. Recovering alcoholics or drug addicts will tell you caffeine is a "gateway drug"--it increases the chances of their falling back into addiction. Overuse can develop into "caffeinism," which may cause muscle twitching, insomnia, headaches and heart palpitations. Even with a mild overdose, about 300 mg or so (3 cups of coffee, 7 cups of chai), you can get "caffeine jitters". You can actually die from an overdose of coffee. The business of "liquid energy" has grown exponentially, and now 31% of 12-17 year olds regularly consume energy drinks. Most energy drinks contain 80 mg of caffeine per 250 ml can (some as much as 300-500 mg), tea contains 30 mg, coffee 90 mg (http://bit.ly/4Owz2y). McDonald's | "Don't Talk To Me / Coffee" commercial. Ves Dimov, M.D. - He had developed tolerance. The same phenomenon is commonly observed in drug addicts. Vamsi Balakrishnan - Still, I think it's amazing. I wonder what his withdrawal would have been like. Bennie Franklin also had some sort of deal with caffeine. Cheat Sheet: The Dark Side of Caffeine. Forbes.com. Caffeine is a major source of antioxidant activity in coffee. WebMD, 2011. At an average of 3 kg of coffee consumption per person per year, Americans are well behind world leader Norway at 11 kg (http://goo.gl/qxgg6).